The signature feature of the Purple mattress is its grid of collapsible columns made from fancy-sounding "hyper-elastic polymer." Putting aside the hype, this construction is certainly one of the most unique options on the market today. But is it right for you? Read on for our full Purple mattress review. Note: This review is for the Original Purple, Purple's first mattress. In early 2018, Purple released the Purple.2, Purple.3, and Purple.4. These models feature a very different support layer made of pocketed coils, so were launched as an expansion of Purple's lineup, not as a replacement for the Original Purple which remains very popular. 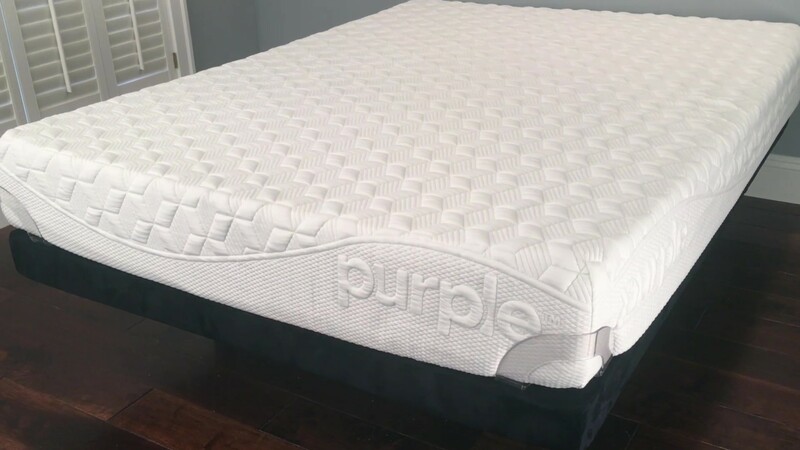 Check out our review of the Purple 4 mattress for a detailed comparison of how these newer options compare to the Original Purple. If you’d prefer to watch rather than read, check out our full Purple mattress video review above. GoodBed's Take – Who is the Best Match for an Original Purple Mattress? The Original Purple mattress debuted in 2015 and is one of the most searched brands on our website. You may have seen a commercial for the Purple mattress in which raw eggs are pressed into the mattress with a 330-lb glass plate without breaking. (We replicated the egg test in our evaluation - read on for our results!). This 10-inch, three-layer mattress mattress features a unique 2-inch top layer made of hyper-elastic polymer, a gel layer made in a honeycomb pattern that gives this bed unique compression qualities that aced our ratings for spinal alignment and back support for certain sleepers. You need to see this gel polymer to get a sense of it; the Purple website has lots of pictures. In our evaluations, we found the Purple mattress to have a Medium softness level, with good overall pressure relief and near-ideal back support for our tester. The honeycomb design means that the top gel layer buckles rather than simply compressing, so the heavier parts of the body (hips, shoulders) are nicely cradled while lighter/concave parts, like the lumbar area, remain supported by the un-collapsed honeycomb gel. The result for our tester was exceptional spinal alignment, particularly in the back position, but also good when positioned on the side. The Purple mattress also excelled in our tests for ease of repositioning. Changing sleeping positions was virtually effortless for our tester, so if you tend to move around a lot while sleeping, the Purple mattress deserves close consideration. Among our concerns: While motion isolation overall was very good with our bowling ball test, and with our human tester, the gel layer does transfer noise and vibration, so it may not be ideal for those who are easily disturbed by a partner that repositions frequently. And while our tester experienced excellent back support, the Purple mattress may be less suited for those who prefer a very soft mattress and like to feel they are sinking in or being cradled by their bed. Lastly, while our tester experienced excellent support from the honeycomb gel comfort layer, we question whether heavier individuals (250 lbs+) will experience the same effect, as they may compress the gel all along the body rather then in specific areas. The Purple mattress’s price is very competitive; free shipping is included, along with in-home setup and removal of your old bedding, a “white glove” service that typically costs $100+ extra with other brands. Note that the Purple mattress does not come with a box spring (nor does it need one). You can place the Purple mattress atop the support of your choice, including a separately purchased box support (supports with springs are not recommended, and will void the warranty), a bed frame, platform bed, or adjustable bed frame. And the Original Purple bed comes in just one style—there are no choices to make other than size, something that may appeal to some but not others. Purple’s widely viewed commercial features raw eggs being pressed into the mattress with a heavy plate of glass. We were eager to replicate this with our own real Purple egg test (VIDEO). We placed a raw egg in a plastic bag, then pressed the egg into the mattress with a piece of glass; our tester also sat on top of the glass with his full body weight. As advertised, the raw egg did not break! Next you have a 3.5-inch transition layer under the honeycomb hyper-elastic gel layer. This layer of foam is quite soft, with substantial compression; it’s almost more of a comfort layer than a support layer. A firmer, 4-inch polyurethane support layer rounds out the three layers. 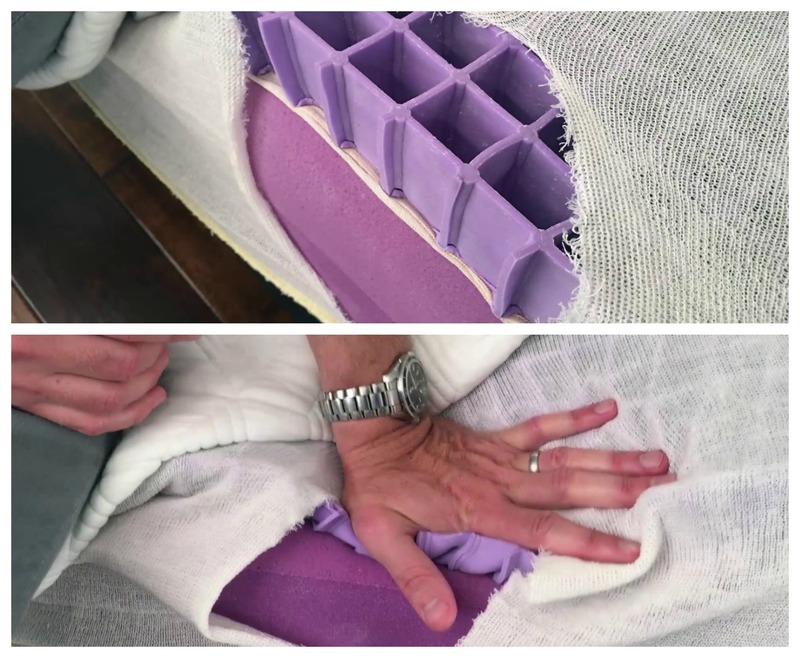 The three layers of the Purple mattress are wrapped in a very stretchy knit cover made of polyester, viscose, and Lycra, which moves and stretches as the top honeycomb layer is compressed. The cover is between ¼ and ½ inch thick, with some padding, so you won’t feel the edges of the honeycomb layer. We classify the Purple mattress as a Medium mattress, right in the middle. We read some complaints online about the mattress feeling too firm, but we didn’t experience this. For our 200-pound tester, the mattress felt nice and squishy when moving around, and perhaps slightly firmer when lying on his back. It’s certainly possibly that very light individuals of less than 100 pounds might experience a firmer feel, as they may not be heavy enough to trigger the buckling effect of the top comfort layer in the same way that those of average weight will do. Due to the honeycomb gel layer, the heavier and pointier parts of your body (shoulders, hips, etc.) collapse the columns of the gel, while the lighter and concave parts of your body (like the lumbar area) stay supported by the uncollapsed gel columns. For this reason, cushioning is focused on the heavier areas of your body. The 2-inch gel layer provides primary cushioning, while the middle transition layer also compresses nicely. Overall, we classify cushioning as average, right in the middle. Our tester found his hips and shoulders sinking into the mattress just the right amount while his lower back remained supported. While the top layer of the Purple mattress is made of gel, its honeycomb/grid construction means that it has a lot of structural integrity. It springs back almost immediately when compression stops. Practically speaking, that means there is none of that ‘memory foam feel,’ where a typical memory foam layer recovers slowly in a melting way. The top gel layer is also responsible for some interesting bounce characteristics. When we dropped our bowling ball on the mattress, it visible bounced, but when our 200-lb tester dropped onto the Purple mattress, he didn’t bounce at all. So the Purple mattress displays significant springback/bounce mainly in the top surface layer. Overall, we thought the Purple mattress offered exceptional support, especially for those who sleep primarily on their backs. Side and stomach positions also felt very supported for our 200-lb tester. It was really all about the top honeycomb layer, which compresses under heavier and more angular parts of the body, like hips and shoulders, but retains its form to support lighter and concave areas, so spinal alignment was a cut above, in our view. We believe that people in the 150 to 250-lb. range would have similar results. Because of the way the top honeycomb layer works, those who are very light (under 100 lbs.) or are heavier than around 250 lbs. may have a different experience. Those who are very light might not be heavy enough to trigger the honeycomb gel to buckle and may feel they are laying on top of the mattress more than in it. Conversely, heavier individuals might engage buckling all along their body which may or may not feel as supportive to them. 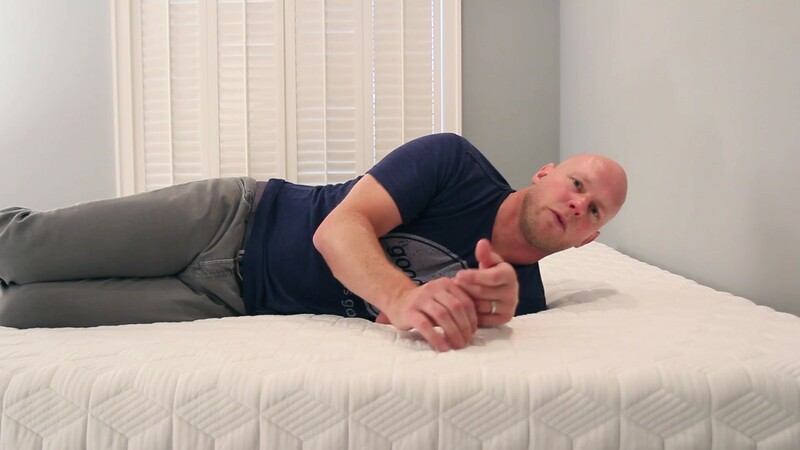 Our 200-pound tester felt this mattress to be exceptional while on his back, with almost ideal spinal alignment. Again, those who are very light (under 100 lbs) or heavier (over 250 lbs) may experience a different response in that top gel layer. A light person might not be heavy enough to compress the honeycomb very much, while a heavier person might compress it all over. But for the majority of people in an average weight range (about 150 to 250 pounds), we think the Purple mattress really hits the sweet spot for back sleepers. Spinal alignment for our tester in the side position was very good. The honeycomb gel layer allowed his shoulders to get deep enough into the mattress to allow the top of his spine to remain level. Overall, we believe the Purple mattress would provide good spinal alignment for most side sleepers. Lighter individuals might not depress the gel layer as much, and heavier sleepers might compress it along their body, and may not experience the same excellent alignment that our tester did. Another consideration is whether you are a particularly curvy person. The top gel will give you about two inches between full compression and no compression, so if the difference between (for example) between where your hips hit the mattress and where your side hits the mattress is greater than two inches, you may find your hips sinking in while your side barely touches the mattress. Achieving good spinal alignment for stomach sleepers can often be trickier as the hips can tend to sink down too far with some mattresses, but our tester felt well supported in this position. Lighter sleepers should also be just fine. However, heavier people might have some issues in this position with hips that sink too much to retain good alignment. Overall, we found the pressure relief offered by the Original Purple mattress to be not as good as a traditional memory foam, or a latex-topped mattress. While the top honeycomb layer does compress under shoulders and hips, it’s quite flat when totally compressed, with the middle transition layer providing some extra cushioning. For the average person, pressure relief with the Purple mattress should be fine, but for those whose needs are acute, such as those with arthritis or fibromyalgia, or for those who are particularly heavy, the Purple bed may not be the best choice. With a bowling pin standing upright on the Original Purple bed, we tested motion isolation by dropping a 16-lb. bowling ball on it, as well as the whole weight of our 200-lb. tester. In both drop tests, the bowling pin wiggled a bit, but never toppled over, owing to the middle foam layer under the honeycomb gel. However, a unique characteristic of the honeycomb layer is that it does transfer vibration. It reminded us of a twanging rubber band. 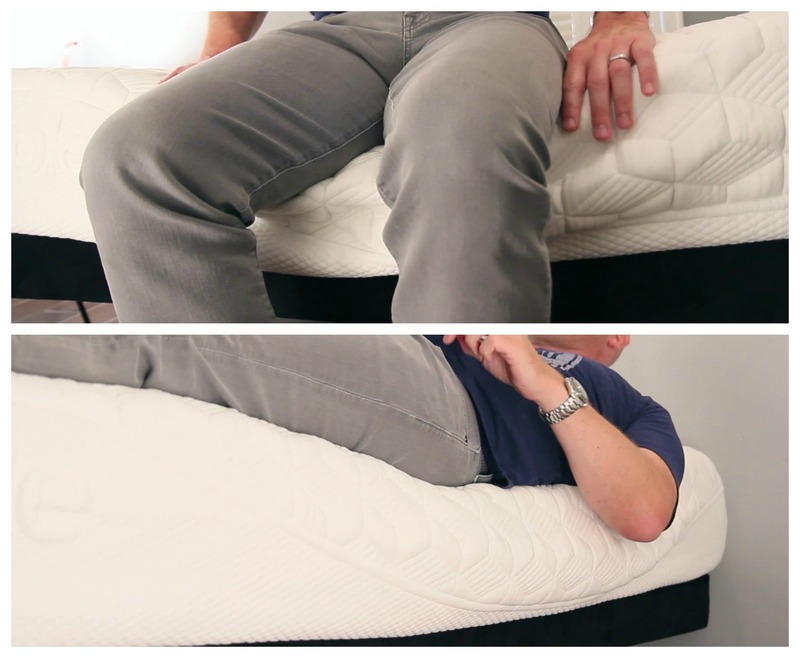 When we tapped on one side of the mattress, the vibration could be both heard and felt on the other side. We felt that the Purple bed could be a good choice for couples who don’t want to feel their partner getting in and out of bed, but for those whose partners tend to move around a lot, their partners may feel vibrations/sound. How annoying or disturbing that is will be subjective to each person. For most people, we think the Purple mattress will not feel hot. The construction of the honeycomb gel layer allows for good airflow, and we know that gel in general helps channel heat away from the body. It’s possible that for very heavy people who fully compress most of the gel under their body, heat distribution may not work as well. Foam mattresses aren’t typically very supportive along the very edge of the mattress—important if you like to sit on the edge of the bed, or if you tend to sleep along the edge. With the Purple mattress, our tester did experience a substantial amount of dip when sitting on the edge of the mattress, but he did feel stable. When laying on the very edge of the mattress, however, our tester felt his body leaning off the edge. While we thought the Purple mattress was better than some memory foam mattresses for edge support, it may not be the best choice if this is one of your priorities. One of the highlights of the Purple mattress, for our tester, was ease of movement, which owing to the high responsiveness and elasticity of the gel layer, was almost effortless. If you tend to change positions a lot, the Purple mattress performed extremely well in our view. In the case of the Purple mattress, the company makes no claims about the use of natural materials, however all of the foams used are certified to the CertiPUR-US standard, which verifies that a material has low VOC off-gassing as well as a lack of chemicals and other substances regulated by the CPSC. The top hyper-elastic/honeycomb layer is made of food-grade gel, so it’s rated to be as safe as, for example, plastic cutlery or food-storage bag (more info on safety certifications on the Purple site). We always give mattresses a “sniff test” and noticed nothing unusual other than a slight ‘new mattress’ smell. The company does assert that returned mattresses will be recycled or donated to charity. If you plan to use your mattress atop an adjustable base, the Purple is a very good choice. In fact, the company even sells its own adjustable base (optional). We tested the Purple bed with a standard adjustable base and found that right away, the mattress conformed nicely. The Purple is a 10-inch mattress with a unique 2-inch hyper-elastic polymer top layer constructed in a honeycomb pattern, which gives the bed unique support and comfort properties. A middle 3.5-inch transition layer, and a 4-inch foam support layer complete the three layer bed, which is topped with a ½-inch cushioned knit cover. When it comes to estimating the comfort lifespan of a mattress, we tend to use foam density as our best, albeit imperfect, predictor of how long a foam will retain its shape and resiliency. In the case of the Purple mattress, we expect the top gel honeycomb layer to be extremely durable, barely changing at all. The lower support layer, with a 2-lb density should also be durable. Our concerns lie with the middle 1.8-lb transition layer of foam, which will see the most compression after the top gel layer. Overall, we expect very good longevity from the Purple mattress, with the possible exception for very heavy people. On balance, we feel that Purple mattress is a unique product that’s exceptionally supportive for the majority of individuals who tend to sleep mainly on their backs and sides. It’s pricing is in alignment with its online peers, and its unique constructions means you are getting a product that can’t easily be compared to others. The delivery policy includes set up and removal of your old mattress, a service that costs extra with many other brands, adding to value. Purple includes free delivery, which is not particularly unusual among its competitors. What does stand out is that Purple includes in-home setup and optional removal of your old mattress free of change. This “white glove service” is, more often than not, an added service with other brands, costing upwards of $100 more. 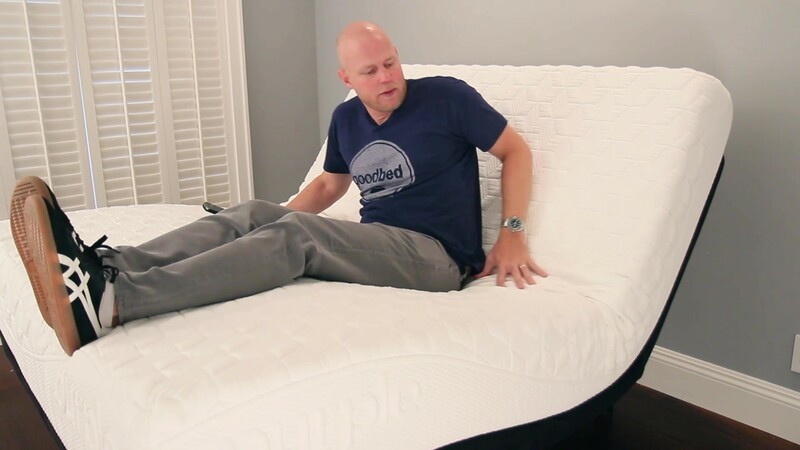 Purple offers buyers a 100-day trial period, and suggests that buyers try the mattress at least 30 days before returning it. Returns within the trial period are free, with pickup of the mattress. See: Purple return policy. One of the biggest, if not THE biggest complaints about any mattress from consumers regards body impressions — the inability of a mattress to spring back, eventually creating a low spot/sinkhole in the mattress. As such, mattress warranties all contain a term defining how big a sag or ‘body impression’ (measured when no one is on the mattress) is considered a defect, and thus covered under the warranty. The industry standard for mattresses is generally between ¾” and 1.5”. Purple has chosen to cover indentations that meet or exceed 1”. Practically speaking, that means any softening or sagging would need to be at least that deep before the warranty would offer you protection. See: Purple warranty policy. Summary: Is the Purple Mattress Right for You? Overall, we found a lot to like about the Original Purple mattress. Based on our findings, here’s who we think is the best and worst match for a Purple mattress. Is the Original Purple bed right for you? Take our Mattress Match Quiz to find mattresses that fit your needs, based on your preferences and price range. Looking for more on the Purple mattress? Click here to visit their website at Purple.com. Combining Purple's famous gel grid with a pocketed coil support unit.